Movie Nights take place at The Backyard every week this march. You can have the complete cinematic experience with unlimited soft beverages, a hot dog and popcorn! The Backyard’s popular food truck along with their regular a la carte and beverage menu will be available for those who want a more hearty dining experience as well. This Tuesday, enjoy watching Notting Hill under the stars. Ladies Night at Yas Waterworld is back for another season. Every Thursday, starting March 8, ladies can enjoy more than 40 rides and slides at Abu Dhabi’s Emirati-themed waterpark. To guarantee the privacy of each lady, photography isn’t allowed and, the best part is, there won’t be a single man in sight. To continue to deliver the same level of comfort ladies have come to know and love, the park will be staffed as usual entirely by women—from the rides to the lifeguards to the DJ. Jebel Ali Recreation Club is hosting a health and fitness day on Saturday, March 10, with an exciting line-up of activities for the whole family all day. Visitors can enjoy a variety of free fitness activities such as aqua noodle classes, karate, aqua circuit, Les Mills’ RPM, Body Pump, Grit and Sh’bam classes, Pilates, yoga, tennis and Dance Infinity classes. There will also be discount vouchers from The Clubhouse and Seafood Kitchen, along with fitness vouchers to enjoy the sports facilities at Jebel Ali Recreation Club, will be given away on the day. Guests can redeem their vouchers during their next visit. In celebration of International Women’s Day, W Dubai - Al Habtoor City hosts a line-up of inspirational speakers and panelists, followed by a high intensity work out session. WHAT SHE SAID, will focus on the W Passion Point of FUEL and will be moderated by Ritu Upadhyay, the Middle East correspondent for Women’s Wear Daily (WWD), with the panel of three including Raha Moharrak; the youngest Arab and first ever Saudi woman to conquer Everest, Engy El Shazly; the first Arab Hijabi ballerina and Somaiah Al Dabbagh; a Pro Bikini competitor and personal trainer.Some powerful women indeed. Kempinski Hotel Mall of the Emirates is home to an art exhibition by contemporary crystal artist Natalie in commemoration of the Year of Zayed. Budding artist, Natalie Dagestani will bring her series of five symbolic artworks to Aspen, the lobby lounge of the property in the heart of Dubai, until March 10. Through her artwork, Natalie has combines painting with her expert crystallization talents, to create unique and eye-catching portraits and pieces of art. Using Swarovski crystals, pearls, glitter and various mixed media, she pays tribute to HH Shaikh Zayed bin Sultan Al Nahyan commending his achievements in making the UAE what it is today. Guests are encouraged to admire Natalie’s beautiful creations over a delicious coffee. Johnson's Baby is hosting an interactive event at JBR walk to introduce their first semi-therapeutic product range, suited to protect baby skin against the harsh environmental conditions in the Middle East. Families will have the chance to come and experience a futuristic technology to test their skin dryness levels and learn more about how to keep babies’ skin healthy and moisturized. Parents can participate in interesting activities, take-away useful goodies and capture memorable moments with their little ones at the Johnson’s Baby tent. The event will host a series of engaging demonstrations to shed light on the most common misconceptions about baby skin, and offer solutions to meet special baby needs in the region. Gold’s Gym UAE introduces a new class for women, My Perfect Shape to coincide with International Women’s Day and will be hosting a free open day for members and non-members on 8th March at all Gold’s Gym clubs across UAE. The class boasts modified calisthenics and body weight exercises amplified with the use of weight-plates and resistance bands to provide added metabolic stress and mechanical tension. All attendees will receive a goody bag on first come first serve basis. This week, take part in wellness week at the Four Seasons and you’ll learn yogic exercises for energy, how to cultivate a calm and peaceful heart, and nutrition for great health. They will also teach you how to boost your immune system, simple mind and body detoxification hacks, and encouragement to stay in a positive frame of mind. Ting Irie have launched a Wings n’ Ting’s night every Monday and Wednesday. The home-grown Caribbean restaurant with a local twist in Downtown Dubai serves restaurant is serving up seven mouth-watering flavours with a unique Caribbean twist including coconut curry, passionfruit, Jamaican jerk and scotch bonnet, which is the pepper of choice in the Caribbean and considered one of the hottest chili peppers in the world, as well as citrus, classic BBQ, sticky appleton and a trio of ting sauces. Couqley, the cosy French bistro in JLT, has opened its doors to its very own Cheese Room. Their recently launched cheese night, will give you a very Parisian feel. Set in the semi-private dining room covered in exposed brick, dim lights and tinted glass, the room will host over 10 varieties of cheese. The special night offers cheese boards with a grape pairing. 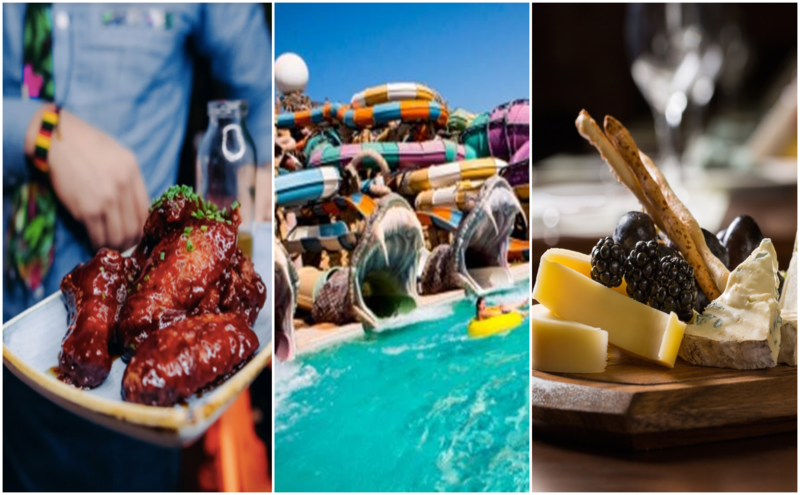 Create memorable moments at the Weekend Brunch Staycation at Ramada Jumeirah Hotel. Immerse yourself with thoughtfully detailed guest rooms, holistic spa massage treatments and distinctive restaurants and bars. The package takes place Every Thursday to Friday and includes: Breakfast for two at Cuisines restaurant from 6am to 11am, the next day you get to enjoy a Friday Brunch for two at Ginger Pan Asian from 12pm to 3pm as well as a 20 per cent discount at the Exhale Spa and Health Club treatments.